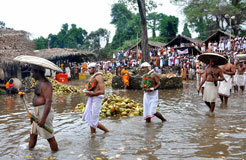 The day after the offering of the tender coconut, 92 Nambiar families partake in “Neyyamrithu”. It’s the “Kaikkollaan” who cut off the mouth of tender coconuts for abhishekam. At the Manithara soon after the sheeveli at noon, Pantheeradi Kambram, performs a hugely powerful pooja. This pooja where “theyambadikal”play the veena cannot be witnessed by any other who are not connected with the rituals. It’s also a rare occasion when even Bhramins gives dakshina to “theyyambadikal”, who are of a lower caste, At night, “Daivathinte varavu Deivasthaanam” is another rite where “Puramgalayan”, dons the image of the “Kiraatha moorthi” and comes in a procession. 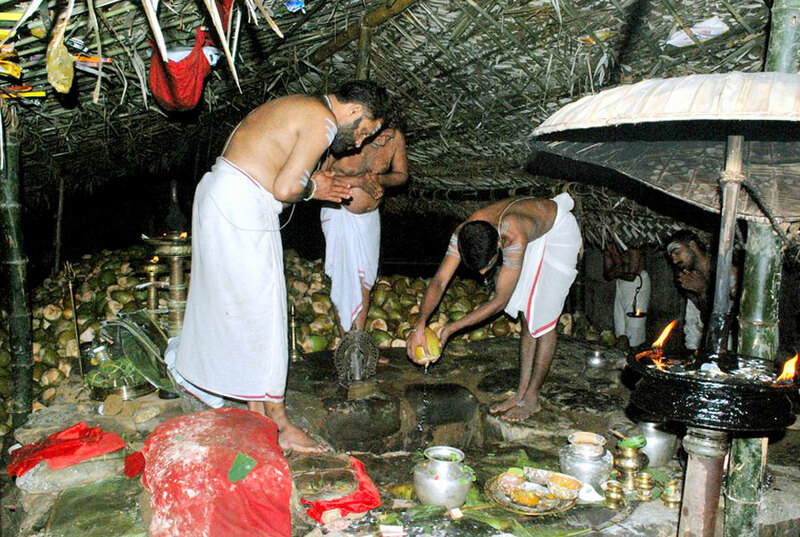 “Peruvannan“reaches the Kotteri kavu at night after Paathramvilli, Next, along with Puram Kalayan, maintaining silence, they sit back to back, perfoming rites.Ottappilaan comes to offer Dhakshina, at Kotteri kavu, After ”Rashi Villi” Peruvannaan now gets up and dresses up Puram kalayan as Kirathamoorthi. Puram Kalayan then awaits under the “Paala” tree. Ottappilan and others come there, bow before him and proceed to Thiruvanchira. On reaching Thiruvanchira, ‘God’ now stands near the Bali Kallu; along with bearers of lighted torches, Lighted from the Manithara. Nambeeshan offers rice and Kallabham, extending his arm between two lighted torches. Vaallashans now raise the sword of Chapparam Bhagavathi. ‘God’ bows before it and returns. Once ‘God’ stands firm under the ‘Paala’ tree, ‘Ottappilan’ with his group, rush screaming towards the Kovilakam “Kayiala”, and pick up anything and everything inside in a rite known as “Kovilakam Kaiala” – Theendal(Making impure), next, its Neyyi abhishekam on God’s idol. Then follows the “Rashi velli” for “Ellaneer Attom”. 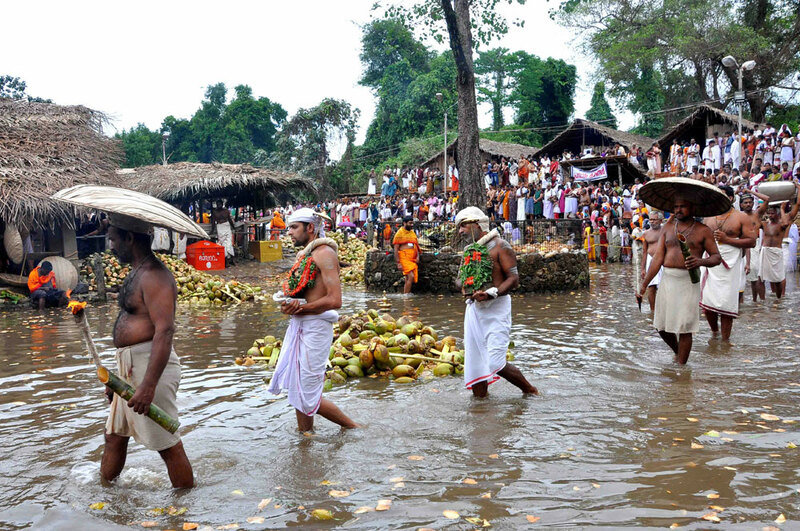 Water from tender coconuts are collected in gold and silver pots by Namboodiries and poured on to the idol as abhishekam. The first tender coconut water is directly poured on. Daily Poojas, which could be delayed due to Ellaneerattom, after this abhishekam of 1000 pots, is resumed. With the abhishekam called “Aayiram kudam” abhishekam. Copyright © 2019 kottiyoordevaswom.com All rights reserved.